I spent some time at the Halifax Game jam a couple weeks ago and made a number of updates while i was there. Most can be seen in this video. I guess i’m all over the place. Here are some enhancements i made to the 2d game. I modified the floor tiles and walls. Also the shadows. The wall/shadow tiles were created in blender this time. I added a new weapon(heatseeker), contrails, explosions. So I’ve been gone a while. I decided about a year ago to make the move over to 3D. I thought it would be a good challenge. Since that time I’ve learned a lot about UDK, Unity, and Blender. I decided to give both Unity and UDK a try to see which I liked better and it was not an easy choice to make. I’ve always loved the Unreal engine so I decided to give UDK a shot first. I just posted 2 videos of some work i did with UDK. The sun and earth are supposed to be seen through the floor similiar to the planet you can see in my 2d shots. As much as I loved how UDK looks and how easy it is to make something pretty, I hated working with the lightmaps, lighting UVs and Unreal script. It takes longer to find the code you want to change than it does to change it. So i moved to Unity(like everyone else). So I started using Unity. I found it so much easier to make ideas reality in Unity. I wish I had access to post processing effects and other Unity Pro features(I’ll spring for it some day). Using C# instead of UnrealScript makes life so much easier and the documentation is all over the web. UDK not so much. 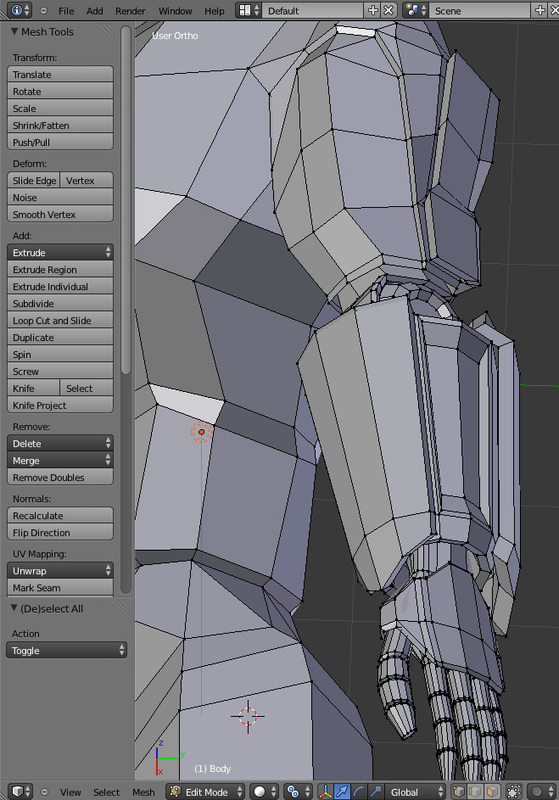 Blender and I are finally seeing eye to eye. I’m starting to make much more complicated models. I’m just at the stage where I’ve been able to rig and animate my models but I have some more to learn and some tweaking to do. This has been the longest I’ve gone so far without posting anything and i am feeling terrible about it. I’m working on something I have not done before and I spent at least 7 days just thinking about it. Then 2 days trying it, then 2 days rethinking, then another day trying it again. I’ll have something nice to show when I’m done though. I cant wait! As promised, here is the video of my AStar implementation running. I’ve been working on some AStar pathfinding. 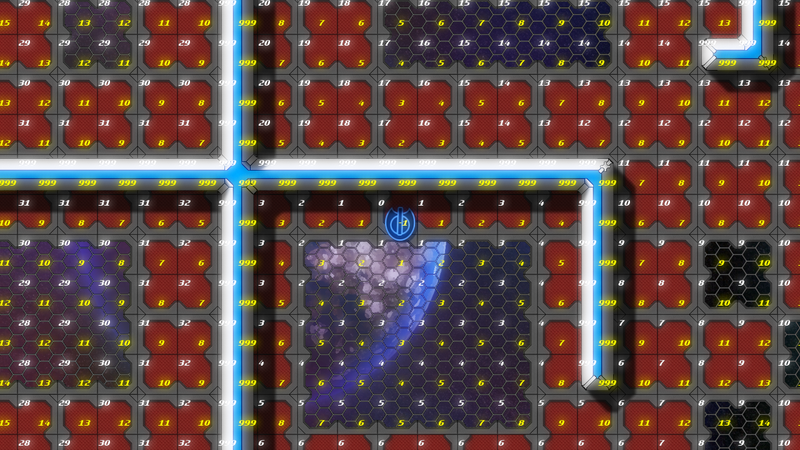 Here is a screenshot where I have overlaid the values from my AStar algorithm over the map tiles. Will post a video shortly of enemies moving around walls to get to the player. I’ve been really busy the last few days adding all sorts of things to the game. I’ve added MUSIC, sounds, particles, soft shadows, new backgrounds, and a new title screen. Ill be uploading a video in the next couple days (maybe a trailer). I’m also working on the RPG elements. I plan to have a lot of weapon upgrades, some NPCs, and some scripted events. I didn’t play any of this before hand and its a lot of work. I also have a deadline to meet for Dram Build Play, so I may have to drop some of these plans till after. I added a few new enemies. 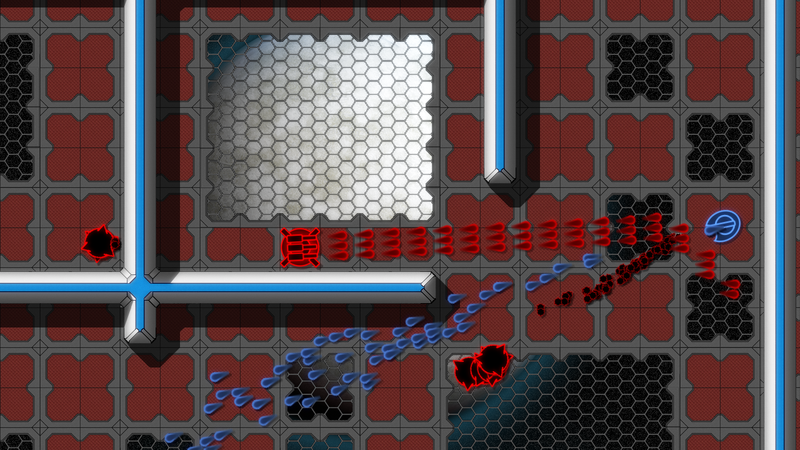 So far I have stupid enemies – These red spinning guys as well as some smaller ones that flock. Both of these enemies simply head for the player at all times. I may change that to be line of sight. I added these turrets. They only react when they can see you. For this to work I had to implement a line of site method. I used Bresenham’s line algorithm. I also modified the graphics a bit. I tweaked my tiles and added shadows, as you can see in the pic below.